Pelican Hill weddings are so beautiful, and it is always a pleasure to work there. The property itself is stunning, and this huge Italian rotunda structure, which overlooks the ceremony area, can be decorated in so many different ways. For this Indian wedding, which was coordinated by Pink Rock Events, the bride chose blush and rose decor to complement to her burgundy lengha. Nisie's Enchanted Florist handled the florals, and created beautiful white flower elephants which were positioned at the end of the aisle. The decor team also hug chandeliers and flower balls inside the Italian rotunda, creating a lavish and elegant backdrop for this lovely Indian wedding. The wedding itself was actually featured in Grace Ormonde Wedding Style magazine, which was a huge honor, as the magazine only publishes 12 weddings per year. 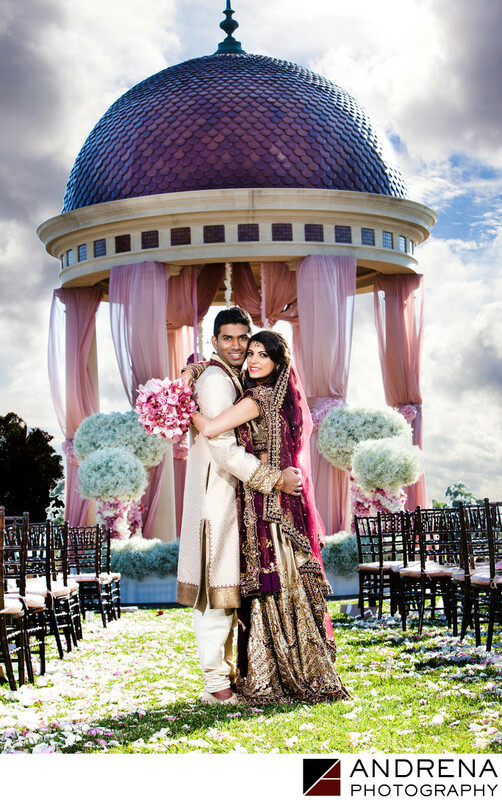 Indian wedding photographed at Pelican Hill, Newport Coast, California.